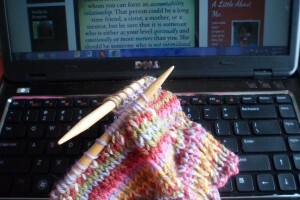 Today I am working on two things that I enjoy, my blog and knitting. 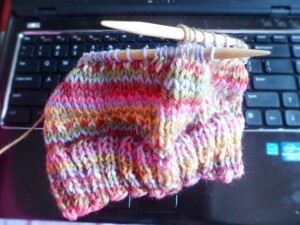 I am working on a hat pattern that I got off of Ravelry. 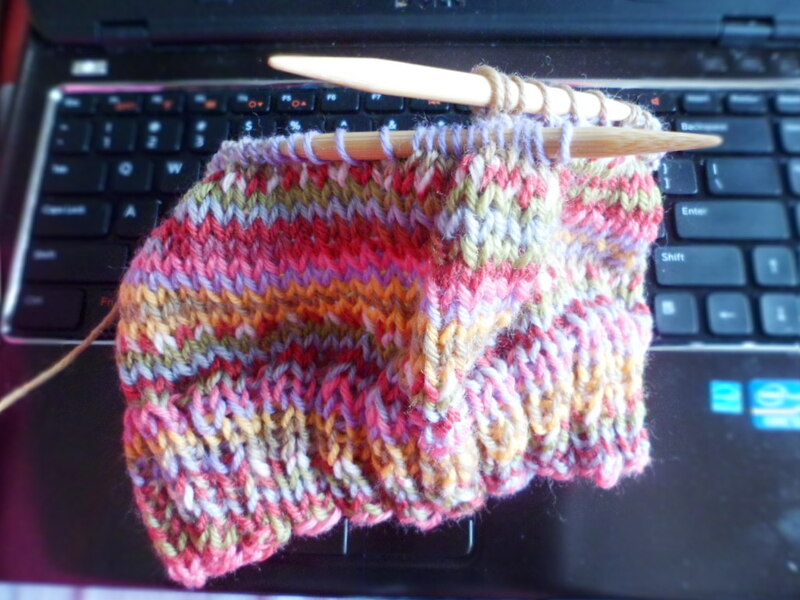 It’s called Child’s Self-striping Hat by Janet D. Russell. I started working on it in the beginning of December. It is a really easy pattern. I had to get a circular needle that wouldn’t cause my stitches to stretch. 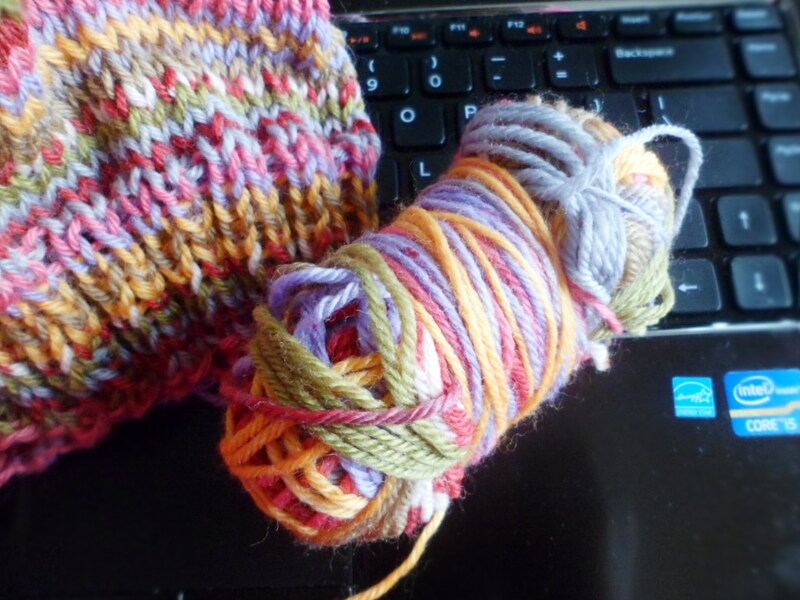 I am using the Adriafil Knitcol yarn in a rainbow color of pink, purple, and yellow. I am making this for my baby girl. I tried it on her and it is a little big, but that’s because I thought that here head was bigger than it is. I know that’s funny, but it’s the truth. She’ll be able to wear it when she hits 6 months. 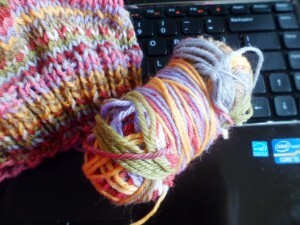 If you are interested in making a hat like this one, check it out on Ravelry. I will also be adding some content on my page about blogging, Twitter, and Facebook. I have found that people have a lot of questions about the ways that they use the internet, but they aren’t sure what to ask. I have also been having a few conversations with my Twitter, Facebook and family about blogging intentions and techniques. I plan on adding a few posts to my site about topics like this. It’s kinda weird, but I find myself saving photos and headlines in my phone so that I can writ a blog post about the topic later. The funny thing is that I very rarely to back and actually write about the topic. I find that although I seem to believe that I will, I’m not actually going to go back and write a post on the topic. 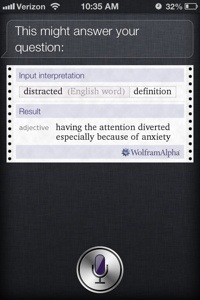 That’s why it’s important for me to blog about a topic while I feel like discussing it. I guess you can call me a spontaneous blogger. Setting schedules and pre-posts just isn’t my thing. At least not right now in my life anyway. If do plan out a post, it’s a miracle that I actually post it. 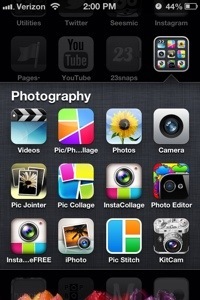 Now I have to empty out my phone’s photos because they are taking up a lot of memory on my device. I hate to let them go, but I’ve got to do it. What we tell (or don’t tell) the kids about Santa Claus. The old pair of (item of clothing) that I just can’t part with. If you don’t have a blog, I hope you enjoy reading my posts. 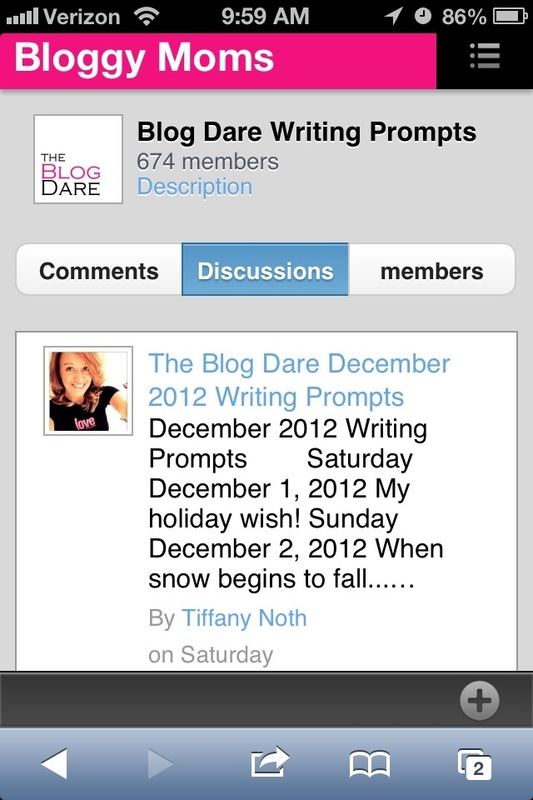 If you do have a blog, consider joining the discussion at Bloggy Moms or write according to the prompts above. I believe there is a way to link your posts in the discussion board for each post. It is early, Monday morning…well, not early anymore. It was early, about two hours ago. On Mondays, there is a lot to do and be done. I have tons of school work. The dishes need to be put away. The laundry needs to be folded. My kids need to be taken care of. Not to mention the rest of the house. Monday is also normally my day to do what I would like to do for myself. Yet, this Monday, here I am. Sitting in front of the computer, working on my blog. What outcome do I want from my blogging? What parameters will I set for myself? Do I have any goals? If I don’t should I? What to I want to get out of my blogging experience? How do I want my blog to affect other people? Some may think that I’m thinking too much about this, but that’s how I am. Over the next couple of days or weeks, who knows, I’ll be asking myself these questions about my blog. If you’re a blogger can you answer some of these questions about your blog? If you’re not a blogger can you tell me what you think?